is a character from The Rocky Horror Show and its film counterpart, The Rocky Horror Picture Show. He serves as Dr. Frank N Furter's handyman as well as Magenta's brother. He was the first resident of Frank's castle who met Brad and Janet. He and Magenta assist Frank when he creates Rocky. Later, Riff Raff scares Rocky out of the laboratory and tells Frank, that Rocky escaped. However, Frank finds out that it was Riff Raff who set Rocky free and punishes him by punching him with a lash. When Frank is using his guest for his macabre show, Riff Raff and Magenta appear, singing that Riff Raff is now their leader and they will return to their planet. When Frank sings that he wants to stay, Riff Raff explains that he meant that only he and Magenta will return home and shoots Columbia to prove the power of the antimatter-laser he's got. He finally kills Frank with the weapon and also kills Rocky. Then, he tells Janet, Brad and Dr. Scott to leave. Before the house flies away, he and Magenta sing the reprise of the song "Time Warp". The character is portrayed by Richard O'Brien in the film. He is a parody of Frankenstein's servant, Fritz/Igor. O'Brien would go on to host Channel 4 gameshow The Crystal Maze from 1990-3. 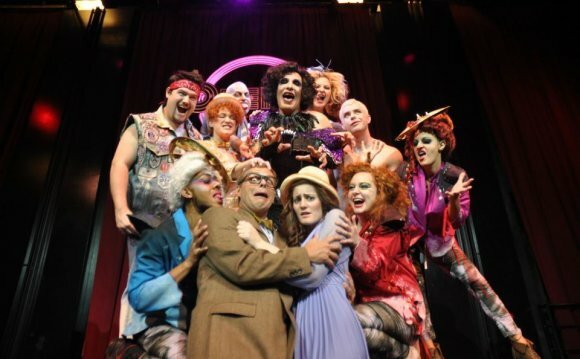 His successor, Ed Tudor-Pole, who took over from 1994-5, had coincidentally played Riff Raff in the 1990 London revival of The Rocky Horror Show.